Powers/Abilities: Billy possessed a variety of super powers including strength, flight and the ability to fire energy blasts. History: Bitter rivals since childhood, Billy and Apache were locked in a deadly struggle to possess a fabled mystical stone. Upon finding it, they were mysteriously transported to the year 2500. Stranded in the post-apocalyptic wasteland of Pax Scion, the two lifelong enemies suddenly found themselves reluctant allies against its ruthless queen Rena Kena, her army of mutant warriors, and her pet mutant dinosaur. Surviving that battle, they then encountered the Baslit, a group of genetically enhanced children, and the aged scientist Aman, who convinced them to set aside their differences and fight for the good of humanity. Via time machine, Aman sent Billy and Apache to ancient Egypt to retrieve the other half of the magic stone and overthrow the alien invaders that had occupied that time period. They somehow earned the respect of the aliens' leader, Lordo, who decided to mend his kind's wicked ways. Lordo then gifted Billy and Apache with mystical rings that gave them whatever super power they would imagine. After that, it was off to the planet Alta to take on yet another army of alien evildoers. On their way back to Earth, Billy got separated from Apache and was sucked through a warp that stranded him in deep space. There, he was met by a cosmic being known as the Watcher, who recruited him to become a Galaxian Knight, tasked with maintaining justice, peace and order throughout the universe. Another Galaxian Knight, the space gladiator Balzaur, accompanied Billy in his missions. Sometime later, Billy returned to Earth and was reunited with Apache. Along with a few other heroes, they formed the fighting force known as the Doom Warriors. Comments: The image on this page is from Reno Maniquis' excellent Capsule Zone site, and is his (gorgeous) interpretation of this character. Image used with his permission. Billy debuted in his own strip, of course titled Billy the Dragon, in Kick Fighter #58. He starred in the series Zero Gravity with Kick Fighter II #118, where he became a Galaxian Knight. 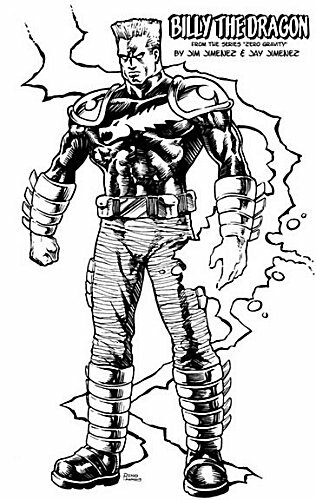 He formed the Doom Warriors in the strip of the same name in Kick Fighter III #1.